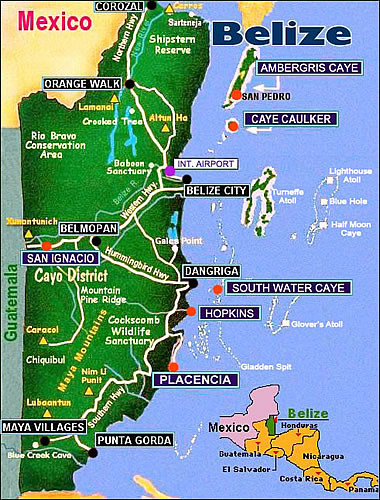 Direct flights from Houston, Miami, Charlotte, Dallas, LA, and Atlanta to Belize International. One hour flight on Tropic Air from Belize International to Punta Gorda. Pick-up and transfer from airstrip is included in all packages. $US20 per person ala carte. Chaab'il B'e Lodge is located 8 miles from Punta Gorda 300 yards off the Southern Highway at Jacintoville If driving from the north, turn right at the south end of the big bridge over Jacinto Creek. Look for our signs at the San Felipe/Barranco road. If travelling by bus, the conductor will know where to let you off. It's a short walk into the lodge along a private, palm-lined drive.